I met a team recently who was concerned about their velocity. They were always “too late” according to their manager. I asked them what they measured and how. They measured the burndown for each iteration. 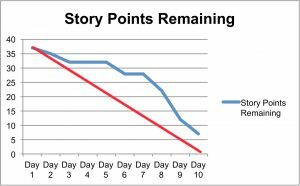 They calculated the number of points they could claim for each story. Why? 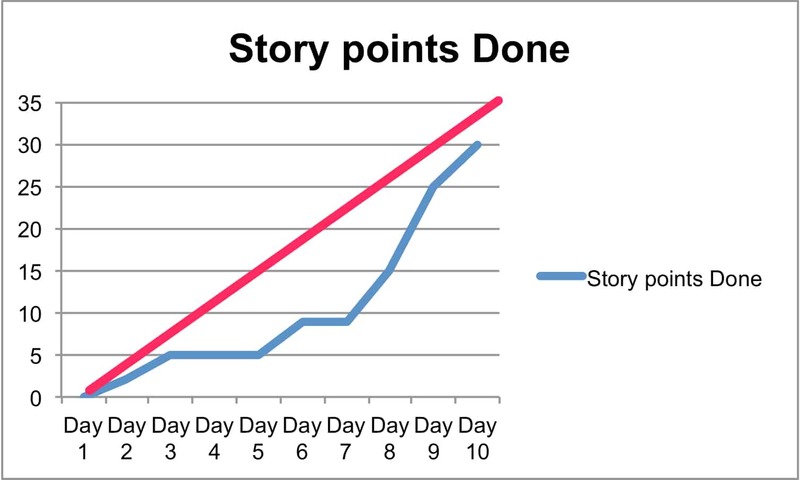 Because they didn't always finish the stories they “committed” to for each iteration. This is what their burndown chart looked like. 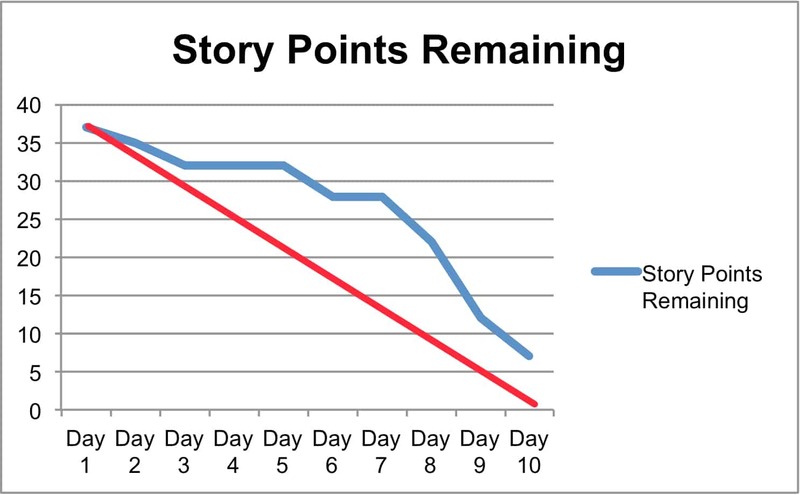 A burndown chart measures what you have finished. If you look at their burndown, you can see there are times when not much is done. Then, near the end of the iteration, they finish more. However, they don't finish “everything” before they run out of time. An iteration is a timebox, by definition. In this case, having to “declare victory” and assess what they were doing should have helped them. But, when this team saw the burndown, two interesting things happened. They beat themselves up for not finishing. And, when they didn't finish everything, they didn't always do a retrospective. In addition, the product owner often took the unfinished work and added it to the next iteration's work. Yes, added, not replaced. That meant they never caught up. They tried this burndown chart next, to see if they could meet their ideal. They realized they were “late,” off the ideal line from Day 2. They felt worse about themselves. A burndown emphasizes what you have completed. A burndown with the “ideal” line emphasizes what you have done and what you “should” be doing. 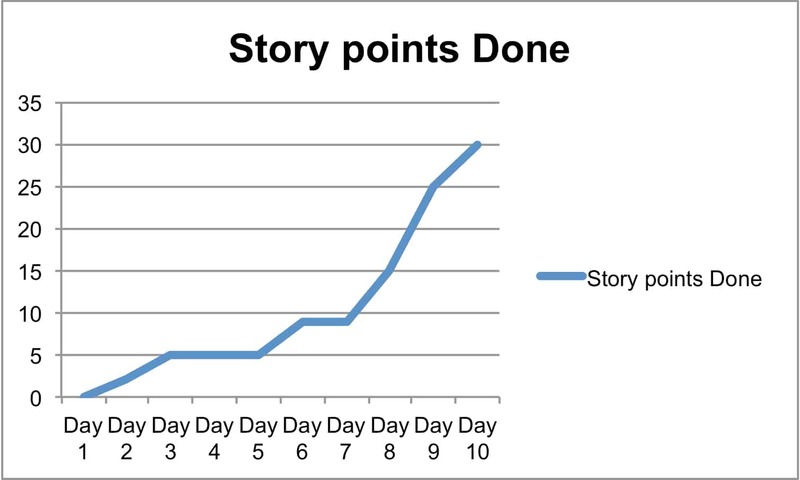 I have used story points here. 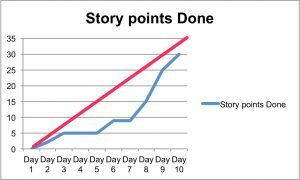 You could look at story points against time, looking at the available hours or people days or something like that. For me, a burndown is interesting, but not actionable. Think about what happens when you take a trip. You plug your destination into your favorite GPS (or app), and it calculates how much longer it will take to get to your destination. You know you have driven some number of miles, but to be honest, that's done. What's interesting to you is what you have remaining. That's what a burnup chart helps you see. I made these charts from exactly the same data. Yet, I have a different feeling when I see the burnups. 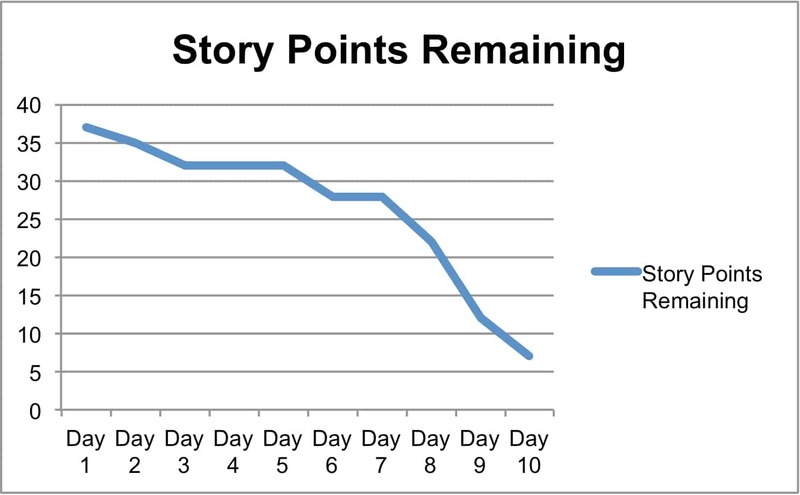 When I see the Story points Done without the ideal line, I see a hockey stick. It's not as bad a stick as the image in Is the Cost of Continuous Integration Worth the Value on Your Program?, Part 1, and it's still a significant hockey stick. When I see this burnup, I can tell by Day 3 that we are “behind” from where we want to be. By Day 5, I know we cannot “make up” the time. As any team member, I can raise this as an impediment in the daily standup. If I am a leader of any sort, I will put this on my list to discuss in the retrospective, if not problem-solve before. 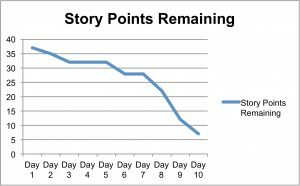 George Dinwiddie has a great article on burndown charts: Feel the Burn: Getting the Most out of Burndown Charts. Oh, and the team I discussed earlier? They decided they were trying to cram too much into an iteration. They made their stories smaller. That put more pressure on their product owner, but then they realized lack of PO time was an impediment. They thought they were to blame with a burndown. They saw their data more easily with a burnup. Maybe we all had a mind-meld going on. It doesn't matter which chart you generate. 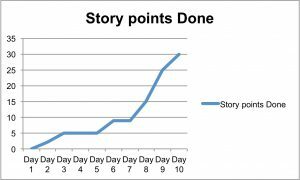 It matters how the chart makes you feel: what action will you take from your chart? If it's not prompting you to act early, maybe you need a different chart. One project truism is: You cannot “make up” time. You can choose actions based on what your data tells you. Can you hear your data? Update: The lovely folks at Agile Translators have translated this post into French: http://www.les-traducteurs-agiles.org/scrum/2016/12/03/valeurs-burnup-burndown.html. Merci beaucoup! Next PostNext What Does Agile Mean to You?